Jean wouldn’t be able stand it if something unfortunate were to befall her friends—that’s why decides to kill them herself, before anything else can harm them. Bad Marie meets Arsenic and Old Lace in this darkly humorous story of a woman whose overpowering love for her friends moves her to murder each and every one of them. 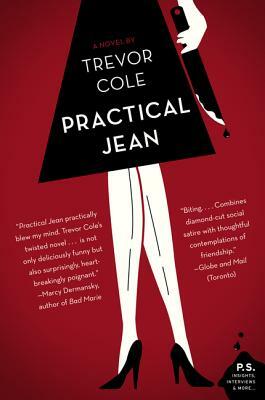 Practical Jean, the U.S. debut of acclaimed Canadian author Trevor Cole, is a “biting and black comedy of middle-class mores gone murderously wrong” that “combines diamond-cut social satire with thoughtful contemplations of friendship” (Globe and Mail). A deliciously dark satire with roots that spread from Jonathan Swift’s A Modest Proposal to Tim Burton’s Edward Scissorhands, Cole’s Practical Jean is a razor’s edge dissection of relationships, faithfulness, and homicide. After all, what are friends for? TREVOR COLE is an award-winning journalist and novelist. His journalism has garnered him twenty-five National Magazine Award nominations and nine awards. His novels, which include most recently Hope Makes Love, have been shortlisted for the Governor General’s Literary Award for Fiction twice and the Rogers Writers’ Trust Fiction Prize, and won the Stephen Leacock Medal for Humour. Cole lives in Toronto.